Try OctaneVR in your browser! Before starting, read the full contest rules and eligibility linked to below. 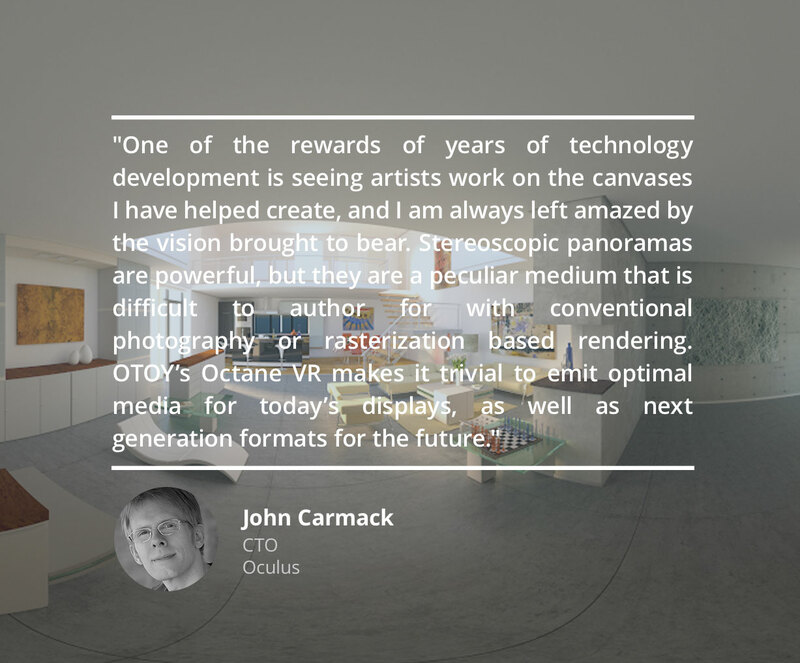 Download a free 3-month trial of OctaneVR or choose to purchase the full OctaneRender. After you download OctaneVR, you may also choose to add-on a 3-month trial of plugins for Blender, Poser, Maya and 3ds Max. Once you’ve rendered your scene, export it as an ORBX media file. View your scene through the ORBX Media Player available on the Oculus Store on the Samsung Gear VR Innovator Edition. Once you’re happy with your scene, register your user information, scene title & description through the “Submit Your Scene” below. Winners will be contacted directly, and will be announced on the OTOY Forums and the OTOY website within two weeks of each contest period ending. First-, second-, and third-place winners will be awarded each month over the three months of the contest. As many entries as you like! But keep in mind, once you submit each entry, it cannot be changed. Still have questions? Just ask us on the OTOY Forums. Important: Please read these Official Rules before entering this contest (the “Contest“). By participating in the Contest, you agree to be bound by these Official Rules and represent that you satisfy all of the eligibility requirements below. Eligibility. THIS CONTEST IS OPEN ONLY INDIVIDUALS WHO ARE AT LEAST 18 YEARS OF AGE (OR THE AGE OF MAJORITY UNDER APPLICABLE LAW) AS OF THE START DATE OF THE CONTEST. RESIDENTS OF QUEBEC, CUBA, IRAN, MYANMAR, NORTH KOREA, SUDAN, SYRIA, RUSSIA AND THE DISPUTED AREA OF CRIMEA ARE NOT ELIGIBLE TO PARTICIPATE. THE CONTEST IS VOID IN THOSE PROVINCES AND COUNTRIES AND WHEREVER OTHERWISE RESTRICTED BY LAW. IF YOU DO NOT MEET ANY OF THESE REQUIREMENTS, OR ANY OTHER ELIGIBILITY REQUIREMENTS IN THESE OFFICIAL RULES, YOU ARE NOT ELIGIBLE TO WIN A PRIZE, AND OTOY, INC. (“SPONSOR” or “OTOY“) RESERVES THE RIGHT NOT TO AWARD PRIZES TO YOU. To be eligible to win a prize, entries must be completed and received by Sponsor in the manner and format designated below. Directors, officers and employees of Sponsor, Oculus VR, LLC, and any of its agents, professional advisors, independent contractors, advertising and promotional agencies, and immediate families of each are not eligible to win any prize. All applicable federal, state and local laws and regulations apply. Disclaimer. Sponsor, Oculus VR, LLC (“Oculus”), all participating sponsors (if any, as mutually agreed upon by the parties) and any of the foregoing’s respective parent companies, subsidiaries, affiliates, directors, officers, professional advisors, employees and agencies (collectively, the “Released Parties“) will not be responsible for: (a) any late, lost, misrouted, garbled or distorted or damaged transmissions or entries; (b) telephone, electronic, hardware, software, network, Internet, or other computer- or communications-related malfunctions or failures; (c) any Contest disruptions, injuries, losses or damages caused by events beyond the control of Sponsor or by non-authorized human intervention; or (d) any printing or typographical errors in any materials associated with the Contest. Contest Period. The Contest starts at 12:00 AM (all times Pacific Time) on April 27, 2015, and ends at 11:59 PM on July 26, 2015 (the “Contest Period“). Entries will be separately judged and prizes will be awarded on a monthly basis during the contest period with three separate consecutive one month entry periods running from the start of the Contest Period each a “Monthly Entry Period” (i.e., each Monthly Entry Period will extend from 12:00 AM on the 27th of each month of the Contest Period until 11:59 PM on the 26th of the following month). Entries entered in one month of the Contest Period will not be carried over or considered for prizes in any subsequent month and may not be re-entered in a subsequent month. All entries must be received during the applicable one month entry period of the Contest Period to be considered for that Monthly Entry Period and must meet all other requirements in these Official Rules to be eligible to win a prize. By submitting your Submission, you agree to the license terms set forth in Section 10 below, and that your Submission conforms to the Content Guidelines and Restrictions listed below and that failure to comply may result in disqualification. Your Submission must not contain material that violates any applicable law or regulation or contain any descriptions or depictions of illegal behavior, including, but not limited to, any depictions of any persons violating applicable laws, ordinances, or regulations of any nature. For All Entries: You may make an unlimited number of unique Submissions. You may not change your Submission after entry. All requested information and material must be provided for your entry to be valid. Failure to submit all required information in the manner required in these Official Rules may result in disqualification. Proof of online entry will not be deemed to be proof of receipt of entry by Sponsor. 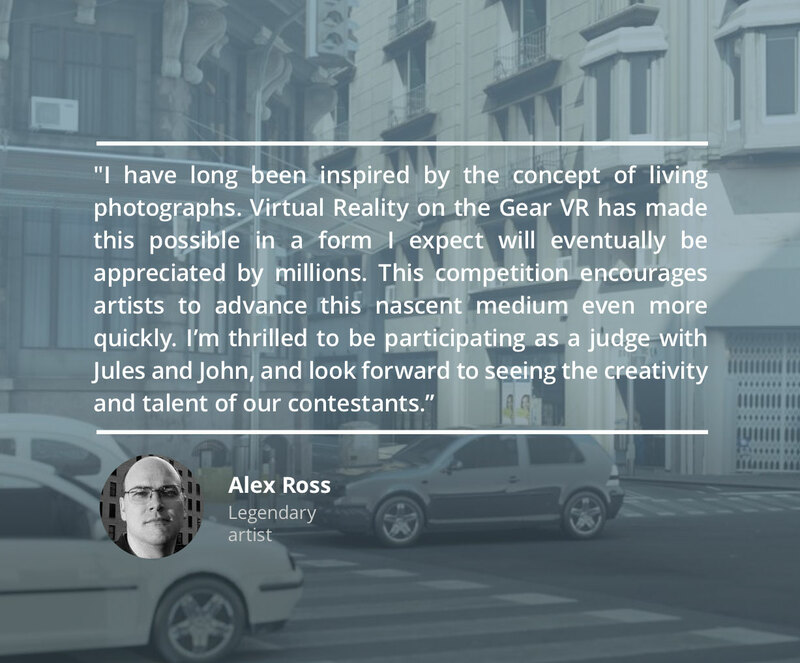 By entering the Contest, you consent to receive promotional material and e-mail, telephone and other communications from Sponsor and/or Oculus regarding the Contest and for other purposes. To enter, you must have a current license to the OTOY OctaneRender software. Selection and Notification of Winners. (e) Overall quality of presentation the Scene. Monthly Entry Period winners will be determined by the Judging Panel in its sole discretion and based on the Submission’s score in the Judging Criteria. The first place winner of each Monthly Entry Period (each, a “Finalist”) will be eligible for the grand prize, which grand prize winner will be determined in accordance with Section 5(ii) below. You may not win more than one prize per Monthly Entry Period (excluding the Finalist in the last Monthly Entry Period, who is eligible to win the grand prize even if awarded in the same month). In the unlikely event that there is a tie, the Submission that received the highest score in the following category will be deemed the winner: Consistency with the Contest’s overall theme of most visually and technically interesting Scene. (ii) Grand Prize Winner. Within two weeks after the close of the Contest Period the Judging Panel will review and score the three Finalist Submissions and choose the grand prize winner based on the Judging Criteria. In the unlikely event that there is a tie, the Submission that received the highest aggregate score from both rounds of scoring in the following category will be deemed the grand prize winner: Consistency with the Contest’s overall theme of most visually and technically interesting Scene. (iii) All Winners. Each potential monthly and grand prize winner will be notified by posting on the forum where entries are made and by mail or e-mail within one week after the winners are selected for each Monthly Entry Period and, in the case of the grand prize winner, within one week after the grand prize winner has been selected. To claim a prize, each winner must follow the instructions contained in his or her notification. Identity of Entrant. If a dispute arises about the identity of an entrant, the authorized account holder of the e-mail address associated with the e-mail address submitted at the time of entry will be considered the entrant. An authorized account holder is defined as the natural person who is assigned to an e-mail address by an Internet access provider, online service provider or other organization (e.g. business, educational institution, etc.) that is responsible for assigning e-mail addresses for the domain associated with the submitted e-mail address. The potential winners may be required to provide Sponsor with proof that the potential winner is the authorized account holder of the e-mail address associated with a winning entry. (i) Monthly Entry Period Prizes. One first place winner for each Monthly Entry Period will receive US$10,000. (Approximate Retail Value (“ARV“): US$10,000). One second place winner for each Monthly Entry Period will receive US$5,000. ARV: US$5,000. One third place winner for each Monthly Entry Period will receive US$2,500. ARV: US$2,500. (ii) Grand Prize. One grand prize winner will receive US$25,000. ARV of grand prize: US$25,000. Odds; Taxes, Etc. Odds of winning a prize depend on the number and quality of eligible entries received. ALL FEDERAL, STATE AND LOCAL TAXES ASSOCIATED WITH THE RECEIPT OR USE OF ANY PRIZES ARE THE SOLE RESPONSIBILITY OF THE WINNER. All prizes will be awarded. If a prize is returned as undeliverable or otherwise not claimed within fifteen (15) days after delivery of notification, the prize will be forfeited and awarded to the next highest scoring entrant. Prizes are not transferable. No substitutions or exchanges (including for cash) of any prizes will be permitted, except that Sponsor reserves the right to substitute a prize of comparable or greater value for any prize. Any and all prizes are awarded “AS IS” and WITHOUT WARRANTY OF ANY KIND, express or implied (including, without limitation, any implied warranty of merchantability or fitness for a particular purpose). All prizes will be awarded in cash or check, as determined by Sponsor. Non-Infringing Entry Materials. You hereby represent and warrant that (a) you have all necessary rights, permissions, power, legal capacity, and authority to grant the rights granted herein (including without limitation in Section 10 below) and that no third party consents are required in order for Sponsor or Oculus to exercise their rights under these terms; and (b) your Submission and the use thereof as contemplated herein does not and will not violate, misappropriate, or infringe upon any law or regulation or the rights of any third party, including without limitation any copyright, trademark, moral rights, or any rights of publicity or privacy, or any other intellectual property or proprietary rights, or entitle any third party to claim equitable remuneration. License to Submissions. By entering the Contest and submitting your Submission, you hereby grant to Sponsor and to Oculus a perpetual, irrevocable, royalty-free, worldwide, nonexclusive license, with a right to sublicense, to publish, reproduce, copy, display, perform, communicate to the public, host, stream, distribute, adapt, edit, modify, enhance, translate, create derivative works based upon, and otherwise use your Submission, or any portion thereof, in connection with the Contest and for any other purposes. Neither Sponsor nor Oculus will have any obligation to use or retain any Submission that you submit or to return any such Submission or Contest entry materials to you. You agree that it is your sole responsibility to obtain all permissions and releases necessary for the grant of the rights contained in this paragraph. You also agree to take, at Sponsor’s expense, any further action (including, without limitation, execution of affidavits, licenses, and other documents) reasonably requested by Sponsor to effect, perfect, or confirm Sponsor’s rights set forth above in this paragraph and elsewhere in these Official Rules. You will not be entitled to compensation for any use by Sponsor or Oculus, or their agents, licensees or assignees, of your Submission. Without limiting the generality of the foregoing, Sponsor, Oculus and their licensees may (a) use, access, copy, distribute, display and perform (publicly or otherwise) the Scene directly and indirectly in connection with or as part of an Oculus Service; and (b) modify or enhance or create derivative works of the Scene as necessary or desirable for Sponsor and Oculus to accomplish the foregoing. “Oculus Service” means the features and services that Oculus and/or its affiliates makes available to users, developers and other third parties through: (i) the website currently at OculusVR.com and any other Oculus branded or co-branded website; (ii) the Oculus platform; (iii) the Oculus application currently named ‘Oculus 360 Photos’, and/or (iv) any or all Oculus products, applications or services that are developed or marketed in whole or in part by or for Oculus. This license includes the right for Sponsor and Oculus to allow users to access and use the Scene. General Release. By entering the Contest, you release Sponsor and all Released Parties from any liability whatsoever, and waive any and all causes of action, for any claims, costs, injuries, losses, or damages of any kind arising out of or in connection with the Contest or delivery, mis-delivery, acceptance, possession, or use of or inability to use any prize (including, without limitation, claims, costs, injuries, losses and damages related to personal injuries, death, damage to or destruction of property, rights of publicity or privacy, defamation or portrayal in a false light, whether intentional or unintentional), whether under a theory of contract, tort (including negligence), warranty or other theory. Use of Winner’s Name, Likeness, etc. Except where prohibited by law, entry into the Contest constitutes permission to use each winner’s name, likeness, persona, hometown, and prize information in all media now known or later devised (including without limitation in the Recordings throughout the universe in perpetuity for all purposes Sponsor and Oculus deems appropriate—including, without limitation, for advertising, marketing, and promotional purposes—without further permission or compensation. As a condition of being awarded any prize, except where prohibited by law, each winner may (in Sponsor’s sole discretion) be required to execute a written consent, confirming Sponsor’s and Oculus’ right to use such winner’s name, likeness, persona, hometown, and prize information without further permission or compensation. Affidavit and Release. As a condition of being awarded any prize, each winner may (in Sponsor’s sole discretion) be required to execute and deliver to Sponsor a signed affidavit of eligibility, acceptance of these Official Rules, release of liability, and any other legal, regulatory, or tax-related documents required by Sponsor in its sole discretion. Winner List; Rules Request. Names of Winners and the their winning Scenes will be posted on the forum where entries are made. To obtain a copy of these Official Rules or a mailed copy of the list of Winners, send a request with subject line “OTOY Oculus 360 Scene Contest Official Rules Request” to the address listed below. The list of Winners will remain available upon request for one year after the end of the Contest Period. Miscellaneous. The Contest and these Official Rules will be governed, construed and interpreted under the laws of the State of California, U.S.A. Entrants agree to be bound by these Official Rules and by the decisions of Sponsor, which are final and binding in all respects. Sponsor reserves the right to change these Official Rules at any time, in its sole discretion, and to suspend or cancel the Contest or any entrant’s participation in the Contest should viruses, bugs, unauthorized human intervention, or other causes beyond Sponsor’s control affect the administration, security or proper play of the Contest, or Sponsor otherwise becomes (as determined in its sole discretion) incapable of running the Contest as planned. Sponsor reserves the right to change these Official Rules at any time, in its sole discretion, and to suspend or cancel the Contest or any entrant’s participation in the Contest should viruses, bugs, unauthorized human intervention or other causes beyond Sponsor’s control affect the administration, security or proper play of the Contest, or Sponsor otherwise becomes (as determined in its sole discretion) incapable of running the Contest as planned. Entrants who violate these Official Rules; violate any law, rule, or regulation in connection with participation in the Contest; tamper with the operation of the Contest or engage in any conduct that is detrimental or unfair to Sponsor, the Contest, or any other entrant (in each case as determined in Sponsor’s sole discretion) are subject to disqualification from entry into the Contest. Sponsor reserves the right to lock out persons whose eligibility is in question or who have been disqualified or are otherwise ineligible to enter the Contest. Any provision of these Official Rules deemed unenforceable will be enforced to the extent permissible, and the remainder of these Official Rules will remain in effect. The Contest and all accompanying materials are copyright 2015 by OTOY, Inc. All rights are reserved. If you have any questions about these Official Rules or the Contest, please send them to [email protected]. Sponsor: OTOY, Inc., 1010 Wilshire Blvd. Suite 1604, Los Angeles, CA 90017. 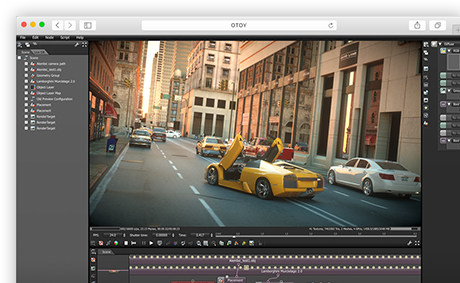 This Website is owned and operated by OTOY Inc. (“OTOY“). By accessing and using this Website, you agree to these Website Terms and Conditions (“Terms”) without qualification. If you do not agree to be bound by these Terms, please do not use this Website and/or Services or continue to use this Website, the Materials and/or Services. Some Services may also be subject to additional terms and conditions as indicated in those Services (“Additional Terms“). If there is any conflict between these Terms and the Additional Terms, then the Additional Terms take precedence. OTOY may periodically revise the terms of these Terms by updating this page. You agree to be bound by subsequent revisions. Accordingly, you should periodically visit this page to review the current Terms. In order to access a Service you may either be issued a unique username and password or be requested to select your own username or password. Where you are requested to select your own password you must not select one which is unsuitable. Unsuitable passwords include number combinations that may be easily guessed and other numbers easily connected with you. In all cases you must safeguard your password. (c) ensure that no one can see you entering your password. (b) unauthorized access to this Website or any Service as soon as you suspect or become aware of that unauthorized access. (b) you suspect or become aware of any unauthorized access to this Website or any Service. (d) leaving a computer unattended when logged on to this Website. Your password, and therefore further use of the Website, the Materials and/or Services, may be cancelled at any time you are in breach of these Terms. link to this Website in any way which misleads any person regarding any association with the Website or your association with OTOY whether implicitly or expressly. (e) in any way that interferes with the function or accessibility of the Website or that restricts the access of others thereto. You must not introduce to this Website, or the System or any Service any virus, worm or any other code designed to interrupt, manipulate or damage the Website, the System or any Service in any way. OTOY has carefully designed the Website with the purpose of delivering certain content to users in a particular format and with a particular appearance. No third party shall have the right to utilize the content of the Website in any way that interferes with that purpose. In particular, OTOY prohibits any party from displaying the content on the Website in any format where third party advertising or other materials that OTOY did not authorize in writing is viewed or viewable together with the proprietary content from the Website. (d) Details of the user’s access to the Website and use of the Services. As a user of OTOY’s products, Services, software and / or Website, you acknowledge and agree that OTOY may hold, use and / or disclose the information it collects to send you important information relating to OTOY’s products, software and Services, including changes to our terms, conditions and policies, or for other administrative purposes, for business purposes, such as statistical and other data analysis, improving our products and services and identifying usage trends, providing our services to you, promotional and marketing purposes, internal research purposes, to protect OTOY’s legal rights, and for any other use that you authorize. OTOY does not guarantee the security of your personal information. Please contact OTOY immediately if you believe your personal information is no longer secure. If you advise OTOY that you do not want it to collect any or all of your personal information, then, depending on the nature of the information you do not authorize OTOY to collect, OTOY may not be able to allow you user access to forums, enable software updates which would otherwise be available to the individual user, or provide other similar benefits or services. This may also otherwise affect OTOY’s ability to provide you with its products and / or Services. As a user of the Services, you acknowledge and agree that OTOY may use any information it obtains relating to you , including, without limitation, your name, postal address, email address, age, industry and location, IP address, browser information, company size, relevant systems data, and other information related to your use of OTOY’s Website and Services, such as the content you access, the time and date of your visit, and your use of Services. This information may be used by OTOY for administrative and business purposes including but not limited to statistical and other data analysis, and promotional and marketing purposes. All rights (including intellectual property rights such as copyright) and interest in any Service accessible on this Website, the Website itself, the Materials and any proprietary information accessible via this Website are the exclusive property of OTOY and you agree that no such rights or interests will pass to you. You agree not to copy or imitate all or any part of the design or layout of the Website. You may not modify, publish, transmit, display, participate in the transfer or sale, create derivative works, or in any way exploit the content of the Website or any portion of it. Except as otherwise expressly permitted under copyright law or as otherwise specifically authorized on the Website with respect to specific elements of the Website, you may not copy, redistribute, publish, display or commercially exploit any material from the Website without the express permission of OTOY and, if the copyright owner is other than OTOY, the copyright owner. In the event of any permitted copying, redistribution or publication of material from the Website, no changes in or deletion of author attribution, trademark, legend, or copyright notice shall be made. You acknowledge that you do not acquire any ownership rights by downloading copyrighted material. You hereby grant to OTOY and its affiliates, licensees, successors and assignees worldwide, royalty-free, perpetual, irrevocable, non-exclusive sub-licensable right and license to use, reproduce, modify, adapt, publish, translate, create derivative works from, distribute, perform and display any e-mail, video, graphic, data, or information sent by you to OTOY (in whole or in part) and/or to incorporate it in other works in any form, media or technology now known or later developed. You agree that the rights of OTOY are irrevocable, and you hereby waive any right to seek or obtain rescission or termination of any of OTOY’s rights or any form of equitable or injunctive relief. OTOY authorizes you to access and use the Website solely for your personal use. You may not sell or modify the Materials. Except as expressly permitted by the terms of any separate license agreement between you and OTOY that is applicable to specific Materials that you may download or access through the Website, you may not reproduce, display, publicly perform, distribute, or otherwise use the Materials in any way for any public or commercial purpose. If you violate any part of these Terms, your permission to use the Materials and the Website automatically terminates and you must immediately destroy and copies you have made of any of the Materials. You are solely responsible for complying with all import and export laws and regulations and all applicable laws of any jurisdiction from which you may access the Website. No portion of these Website or Materials is targeted to children, and any minor is required to obtain the consent of his or her parent or legal guardian before using the Website. By accessing the services, you represent and warrant that you are not a minor. You are solely responsible for any and all content posted by you on the Website. You also are solely responsible for, and assume any and all risks associated with, reviewing and/or using any content posted on the Website by other users. OTOY does not endorse, edit, verify, vouch for, or control any content posted on the Website by users, and does not guarantee the accuracy or appropriateness of any content posted by users. Users may be held legally liable for any content that they post to the Website, and may be held legally accountable if the content they post includes material that infringes any patent, trademark, trade secret, copyright or any other intellectual property or the proprietary right(s) of any person or entity. OTOY reserves the right to monitor any of its user interactions or user generated content at any time to ensure that these rules are being observed. Any material containing any unsolicited or unauthorized advertising or commercial solicitation of any kind whatsoever, including, without limitation, distribution of unsolicited e-mail using an OTOY address or containing any references to OTOY (“spam”), “junk mail,” “chain letters,” “pyramid schemes,” or any use of distribution lists to any person or entity who has not given specific permission to be included on such a list. Any content or activity that OTOY, in its sole discretion, deems inappropriate. OTOY does not accept or consider ideas, suggestions, creative materials or business propositions other than those it has specifically requested. This policy is designed to avoid misunderstandings if projects developed by OTOY or its related parties seem to others to be similar to their own work. If you nevertheless provide any unsolicited ideas, suggestions, creative materials or business propositions to OTOY or if you provide any feedback or suggestions for improving OTOY’s products or services, you hereby grant to OTOY an irrevocable, non-exclusive worldwide perpetual license in the same and OTOY will be free to use the same without compensating you in any way. The stability and availability of this Website is dependent on the stability and availability of the System, OTOY’s internet service provider, infrastructure hosting provider and the nature of the internet. Accordingly, access to this Website, the Materials and the Services is not guaranteed, represented or warranted whatsoever to be error free, delay free or uninterrupted and OTOY will not be liable for any such errors, delays or interruptions. You agree that OTOY may remove all or any part of the Materials and/or the Services for indefinite periods of time or cancel all or any part of the Services at any time, without notice to you or any other person. OTOY will not be liable to you or any other person if it does so. The security of information transmitted over the internet cannot be guaranteed and OTOY expressly disclaims (to the maximum extent permitted by law) all liability for any breach of security while information is transmitted over the internet. In addition, OTOY does not guarantee, represent or warrant whatsoever that this Website, the Materials, the System and/or any Service will be free from loss, corruption, attack, viruses (or any kind of malicious code whatsoever), interference, hacking or any other security intrusion. OTOY in its sole discretion may for security or technical reasons prohibit or restrict your access to this Website, the Materials and/or any Service at any time and without notice to you or any other person. OTOY may temporarily suspend your access to this Website, the Materials and/or any Service to carry out maintenance, repairs, reconfigurations or upgrades. OTOY may update or change the content, nature and functionality of this Website, the Materials, the System and/or any Service or discontinue any Service from time to time without notice to you or any other person. OTOY may in its sole discretion terminate your access to this Website, the Materials and/or any Service at any time without notice to you or any other person. You warrant that all information and details provided by you via this Website are true, correct, complete and accurate in all respects. This Website, the Materials and the Services are provided on an “as is” and “as available” basis. To the maximum extent permitted by law, all representations, warranties (including as to merchantability and suitability for any purpose), undertakings and guarantees, whether express or implied, are excluded and OTOY does not give any representation, warranty, covenant, undertaking or guarantee whatsoever including, without limitation in respect of the availability, accuracy, completeness, currency or reliability of the information provided via this Website, the Materials and/or any Service. If you are dissatisfied with any of the materials or services contained in or accessed through the Website, or with any of these Terms, your sole and exclusive remedy is to discontinue accessing and using the Website and Materials. OTOY’s rights shall survive any such cessation of use. WITHOUT LIMITING THE FOREGOING, EXCEPT AS EXPRESSLY STATED IN THIS AGREEMENT, OTOY MAKES NO REPRESENTATIONS OR WARRANTIES OF ANY KIND TO YOU, EITHER EXPRESS OR IMPLIED, AS TO ANY MATTER INCLUDING, WITHOUT LIMITATION, IMPLIED WARRANTIES OF FITNESS FOR A PARTICULAR PURPOSE, MERCHANTABILITY, NON-INFRINGEMENT OR OTHERWISE WHICH WOULD EXTEND BEYOND THE REPRESENTATIONS AND WARRANTIES CONTAINED IN THIS AGREEMENT. You assume all risks that the Website, Materials and related products, services and information are suitable or accurate for your needs and will be uninterrupted, timely, secure or error free. Any applications uploaded or downloaded or otherwise obtained through the Website are at your own discretion and risk and you are solely responsible for any damage to your computer or loss of data. You agree that OTOY shall not be responsible for any loss or damage of any sort relating to your dealings with any third party advertiser or content provider on the Website. The Website contains links to third party sites that are not under the control of OTOY and OTOY is not responsible for any content on any linked site. If you access a third party site from the Website, then you do so at your own risk. OTOY provides links only as a convenience and the inclusion of the link does not imply that OTOY endorses or accepts any responsibility for the content on those third party sites. An electronic or physical signature of the person authorized to act on behalf of the individual whose rights may have been violated. A description of the material that you believe violates your legal rights and the way in which you believe that your legal rights are violated. Your notice may be sent to the email address for copyright complaints provided above. OTOY AND ITS AFFILIATED ENTITIES AND THE EMPLOYEES, CONTRACTORS, ACCOUNTANTS, ATTORNEYS, AGENTS, HEIRS, SUCCESSORS, LICENSEES AND ASSIGNS OF EACH OF THEM (THE “OTOY PARTIES”) SHALL NOT BE LIABLE FOR ANY DIRECT, INCIDENTAL, CONSEQUENTIAL, INDIRECT, OR PUNITIVE DAMAGES ARISING OUT OF OR CONNECTED WITH (I) YOUR USE OF THE WEBSITE AND MATERIALS AND (II) ANY OTHER SUBJECT MATTER OF THIS AGREEMENT. THE MAXIMUM LIABILITY OF THE OTOY PARTIES TO YOU FOR ANY CLAIM UNDER ANY LEGAL THEORY RELATED IN ANY WAY TO THIS AGREEMENT OR THE WEBSITE OR MATERIALS WILL BE US$100. (c) all costs, losses, claims or liabilities of OTOY (and each of its directors and employees) arising from any use of your password not expressly permitted in these Terms. If any provision of these Terms shall be unlawful, void, or for any reason unenforceable, then that provision shall be deemed severed from these Terms and shall not affect the validity and enforceability of the remaining provisions. These Terms are governed by the laws of California and you submit to the exclusive jurisdiction of the Los Angeles, California courts in respect of all matters relating to these Terms and your use of this Website, the Materials and/or any Service. This agreement and any other specific written terms that OTOY requires you to accept as a condition of access to any feature of the Website or Materials are the entire agreement between the parties and may only be modified as expressly provided in this agreement and in such other written terms. “Materials” means any materials provided to you by OTOY or available to you by via this Website. “Services” means the services accessed or provided via this Website. “System” means OTOY’s system used to drive, support and administer the Website and provide the Services. © Copyright OTOY Inc. 2015. All rights reserved. 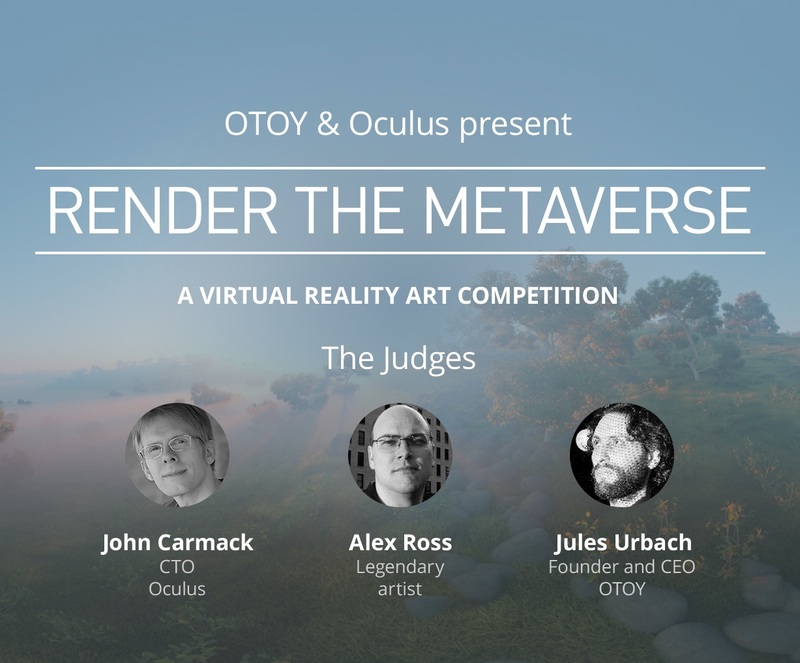 Download OTOY’s OctaneVR software for free during the duration of the contest to produce your entry. 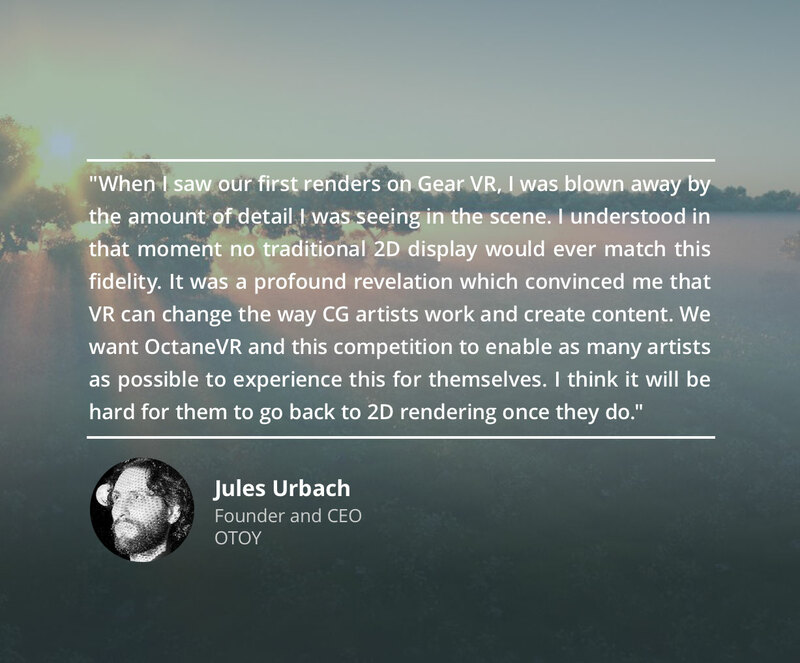 OctaneVR introduces artists to the world of virtual reality rendering and employs the same pipeline OTOY has used to develop exceptional VR experiences for a wide range of Hollywood studios and brands. Want to preview OctaneVR right now? Take OctaneVR for a spin right in your browser. Render with ORC and harness the cloud for speeds up to 25 times faster! Ready to submit your 360 VR scene? Sign into the OTOY Forums to upload your entry. Good luck! OctaneRender 4™ is out today! OTOY® once again advances the state of the art of GPU rendering with the release of OctaneRender 4™ - available now - with groundbreaking machine learning techniques, out of core geometry support and massive 10-100x speed gains in the scene graph. OTOY and Epic Games are thrilled to announce a preview of the OctaneRender 2019 integration with UnrealEngine 4, designed to bring AI-accelerated GPU path-tracing and light field baking to Unreal Engine-powered games, film, VFX, arch vis and mixed reality applications. At F8, OTOY and Facebook launch partnership to produce affordable volumetric and interactive 360-degree video with six-degrees of freedom, creating the “workflow of the future” for virtual and mixed reality.